Fans of backyard barbecues: Let the Grill god show you the light. He’ll also bring the heat, but don’t worry, it’s not hellfire. No repenting necessary. The ad character, created by viral video mavens the Harmon Brothers, is a toga-wearing home cook who’ll whip up something carnivorously divine while a gospel choir provides a rousing soundtrack. Praise the lord, and pass the coleslaw! He even converts a “vegan goddess,” who finds herself covered in marinade and gnawing on brisket by the end of his neighborhood gathering. Ah, temptation. The Harmons are known for such off-kilter mashups in videos for Chatbooks, Squatty Potty, Poo-Pourri and Purple mattresses. Their latest, which launched Wednesday, centers on a character who sports a laurel wreath on his head and a spice-filled tool belt around his waist while talking unholy smack about conventional grilling methods. Don’t even consider charcoal (blasphemy! ), and the results of gas grilling (burned on the outside, raw in the middle) show off “the devil’s work.” “If that cow wanted to be cremated, he would’ve put it in his will,” says Grill god. And putting five Cuban cigars in a chickens mouth will not give you the smoked food you so desire. In the digital short, Grill god, played by J.W. Hutson, saves a hapless suburban dad from yet another disastrous cookout by introducing him to a product that combines wood and gas grilling with smoking and extreme-heat searing. He also stops him from doing an embarrassing white-guy dance. The five-minute video takes its cues from other Harmon Brothers ads: It’s a modernized infomercial and a direct-sell message wrapped in a cheeky piece of entertainment. 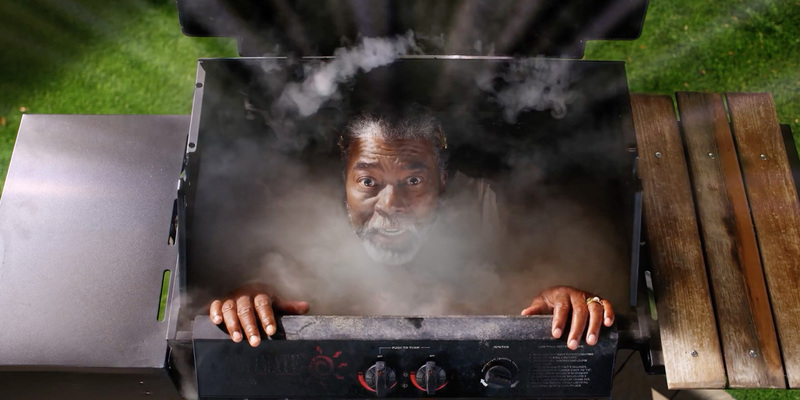 The digital short, titled “The Secret Weapon of BBQ Perfection,” is the most significant advertising effort in Camp Chef’s 27-year history, Measom said. It will launch the Woodwind, which is an upgraded model with added features in a category of grilling that’s begun to, well, sizzle. So-called pellet grills, priced anywhere from $500 to $1,200, have been mostly specialty items for the better part of a decade, he said. He wanted a video star who could make the product “approachable and accessible” to everyone from veteran chefs to barbecue novices. He thinks Hutson works so well in the video that he might use him for other brand campaigns, voiceovers and social media. He envisions a potential line of Grill god seasonings, recipes and cooking accessories. The Harmon Brothers kicked off the new video, which will be distributed primarily via Facebook, Instagram and YouTube, with an outdoor barbecue on Wednesday near their Provo, Utah, headquarters. Local chefs went head-to-head on Woodwind grills, with guests eating (and judging) the results. Hutson, whom Harmon described as “an old Texas cowboy who rides horses, ropes cattle and loves barbecue,” was on hand to “bless” the proceedings.